The earth we live in, there are people leading different lives and living with diverse thoughts and troubles. 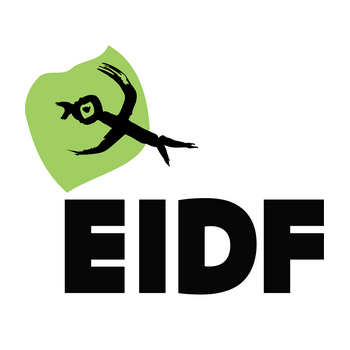 EIDF would like to share such diversities with the world this year, but our goal does not stop at just sharing. We look forward to seeing those thoughts and troubles turn into hopes when they are shared with the audience who empathize with them. Then those breakthroughs, which appear in the documentaries, can be the clues and keys to solve the issues we face. That is the world that EIDF dreams; the audience can meet the other side of the world by watching, empathizing and make actions. We face the world with various angles through documentaries. The window of ‘EIDF’ in the poster embodies the gaze toward our present and future. There are education, technologies, cultures, and ever-changing contents where the gaze reaches. The various aspects of life over the window give us special guidance to lead creative lives. The background of this year’s poster is blue. As this color implies, the sharp and collected gaze, which discovers the mysteries hidden in our world along with new approaches, is a core value of documentaries. Furthermore, the attitude of actively coping with the upcoming future with this gaze is also the element that makes documentaries meaningful. This year’s EIDF presents a special event combined with music concert and documentary story in a summer night to celebrate the festival and the 1st anniversary of the relocation of EBS’s headquarters to Goyang. With the goal of offering a documentary festival to be enjoyed by all, EIDF has prepared outdoor screenings in collaboration with Goyang City and World Vision. Taking place at the Musical Fountain in Ilsan Lake Park, the outdoor screenings will offer everyone a chance to beat the summer heat and leave with wonderful memories. Every year, the EIDF Special Forum serves as an extension of the EIDF Special Section that focuses on a contemporary issue, thereby providing a platform for further discussion among experts from various fields. This year’s Forum invites architectural experts to consider the significance of architecture in urban environments. Aimed at up-and-coming documentary producers interested in venturing into the global market, the Global Pitching Academy was newly launched this year. In addition to lectures by renowned documentary producers, directors, and experts from Korea and abroad, the Academy offers a specialized and personalized curriculum, especially through its one-to-one mentoring service. The Young Pitch is an open pitching program aimed at graduates of the Global Pitching Academy. Outstanding participants will be given a chance to visit the International Documentary Film Festival Amsterdam (IDFA) for its pitching forum, and receive production aid. The most successful team will be invited to the Korean Pitching Day at IDFA.